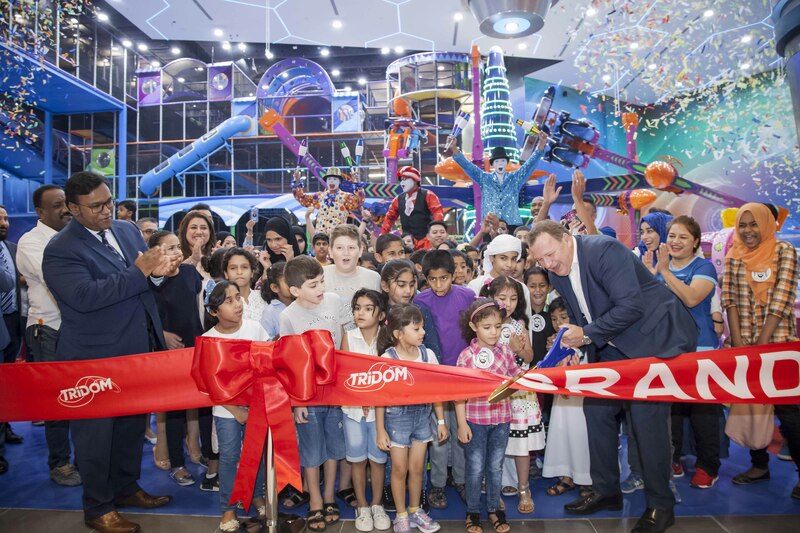 Dubai, United Arab Emirates July 9, 2018: Tridom, Ras Al Khaimah’s largest indoor adventure and entertainment park, is inaugurated at the newly refurbished Manar Mall by the Al Hamra Group. The family fun oriented indoor hub of fun boasts a mammoth 130 ft tall drop tower as well as the largest indoor play area in the entire country. With a unique entertainment experience guaranteed to get the adrenaline pumping, patrons can beat the summer heat at Tridom with innovative as well as much-loved big rides available in an indoor facility. Tridom is the latest addition to the Landmark Leisure portfolio, which includes Fun City, Fun Ville Fun City, Fun Ville, Fun Works, and Fun Block. 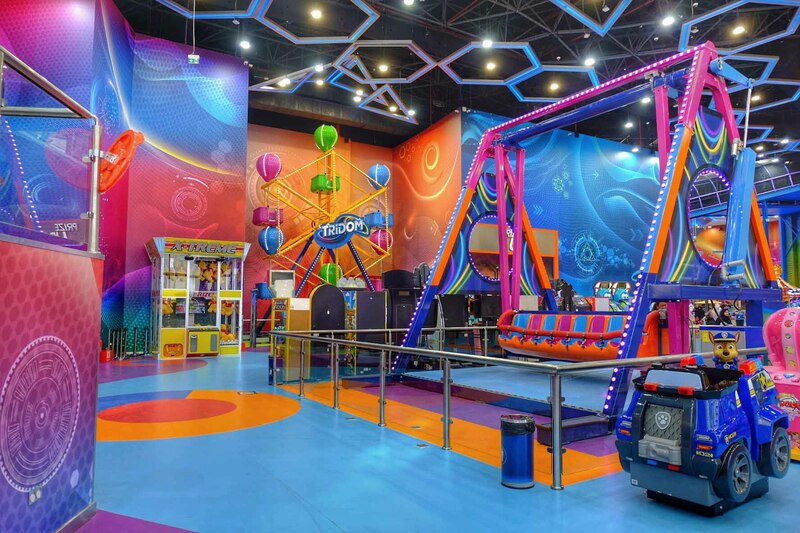 Unlike adventure parks with entrance tickets, Tridom works entirely on a top-up Power Card system that allows patrons to swipe to play videogames, redemption novelty games, store tickets from redemptions, as well as access big rides, kiddie rides and the Play Zone arena. The card can be topped up from anywhere on the Tridom mobile application, as well as in-store. 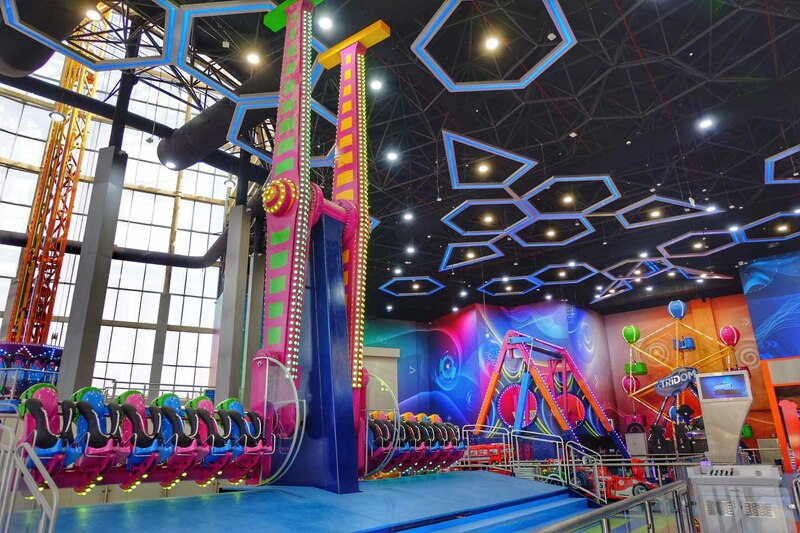 The indoor play park offers a massive 130 ft drop tower ride called the Sky Tower Ride, the largest thus far in the Middle East. It also hosts the largest playground in the UAE, a Ferris Wheel, a Super Spin ride that twirls riders mid-air 360 degrees, Bumper Cars, the Air Racer that allows one to feel like they’re flying, and a Disk’O Coaster which has patrons rocking and spinning. Commenting on Tridom’s imminent opening, Benoy Kurien, General Manager of Al Hamra Group, said: “The addition of Tridom to our extensive family offering is an integral part of our strategic plan for Manar Mall. “We are attracting a number of internationally recognised brands, which in turn are anchoring our position as the top attraction in the Northern Emirates and the leading destination for shopping and entertainment. “And Tridom’s timing couldn’t be better, with Ramadan and Eid Al Fitr being such a special time for families and with the summer months nearly upon us, it will also be somewhere that families can escape from the heat,” added Kurien.